Director (Information) Ashutosh Niranjan, however, claimed that the department has been planning to launch such a helpline for some time and that the move was not related to the Shahjahanpur case. 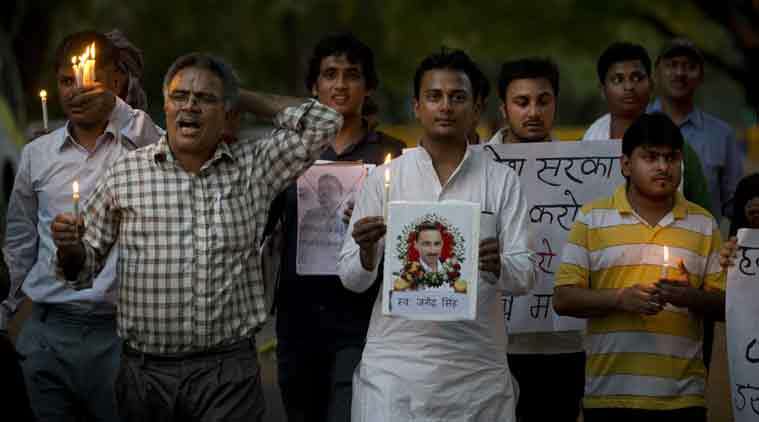 Days after Shahjahanpur-based freelance journalist Jogendra Singh succumbed to burns after he was allegedly set ablaze at the behest of UP minister of state Ram Murti Singh Verma, the SP government has come up with a plan to launch a helpline for journalists. “The basic idea was to address the various complaints of journalists. Like for example, their accreditation card might be pending. There are journalists in far off districts, they should not have to come to Lucknow with their grievances,” Niranjan said. “The number will either be toll free or be available at a very nominal cost. We plan to make it operational within a month,” said Niranjan. The journalist fraternity, however, has its reservations about the helpline. “Whatever the state government does to address the grievances of journalists — whether through a helpline or any other mechanism — it should be effective,” said UP Working Journalist Union president Hasseb Siddiqui. “Rajnath Singh had launched Patrkar Bandhu (when he was the chief minister of Uttar Pradesh) but it remained ineffective,” he added. “Launching a helpline is a welcome move… but there have been similar attempts in the past,” said Siddharth Kalhans, president of the Lucknow Working Journalist Union. He added that a committee was set up for journalists in October last year by the incumbent state government. It had top officials from departments like home, information, housing and health, besides journalists, but remained largely on paper. “Neither did the committee organise any meetings nor did any government official cared to attend,” Kalhans said. “Often, there is no response when journalists approach the DM, the divisional commissioner or the SP with a complaint. So, this puts a question mark on the effectiveness of the helpline,” he added.